Nikon AF-S 18-200mm VR Lens. •The VR works wonderfully. D3000, D3100, D3200, D3300, D3400, D5000, D5100, D5200, D5300, D5500, D7000, D7100, D7200, D40, D50, D60, D70, D80, D90, D100, D200, D300 etc. Trending at $239.50eBay determines this price through a machine learned model of the product's sale prices within the last 90 days. Sigma DC 18-200mm F3.5-6.3 for Canon AF - SLD Glass - New. 4.5 out of 5 stars - Sigma DC 18-200mm F3.5-6.3 for Canon AF - SLD Glass - New. 3 product ratings3 product ratings - Sigma DC 18-200mm F3.5-6.3 for Canon AF - SLD Glass - New. This lens is perfect for travelling and covers a wide variety of photography applications, such as landscapes, portrait, macro and general purpose shooting. Sigma 18-200mm F3.5-6.3 DC Macro OS HSM 'C' Lens for Canon EOS. This lens is perfect for travelling and covers a wide variety of photography applications, such as landscapes, portrait, macro and general purpose shooting. Hyper Sonic Motor (HSM) ensures quiet, accurate and fast autofocus. This lens is perfect for travelling and covers a wide variety of photography applications, such as landscapes, portrait, macro and general purpose shooting. Sigma 18-200mm F3.5-6.3 DC Macro OS HSM 'C' Lens for Nikon AF. E PZ 18-200mm F3.5-6.3 OSS. Great lens for video. As with most scratches on any lens, this is not visible in the photos at all, even if you look for it, so the picture quality remains perfect. The power zoom works great. This is the new "LE" version, available in black only. The E 18-200mm has a 11x zoom range and has the added benefit of Optical Steady Shot image stabilisation. It is stylish with high quality aluminium alloy finish. This can be especially helpful when shooting at long focal lengths or up-close macro shots. OS also allows you to use slightly longer shutter speeds, making it possible to shoot hand-held in low-light conditions. Produktlinie Nikon Nikkor AF-S DX. Exclusive Nikon Super NIC multi layer compensation reduces flare and aperture reflections to a minimum. Optical construction: lenses / links: 16 / 12. Round aperture with seven blades. Part Number: SIGMA 885955. Compatibility: Nikon. 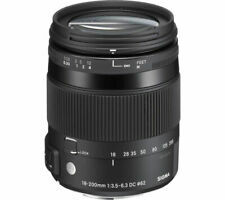 The Sigma 18-200mm 3.5-6.3 DC HSM OS lens is the second addition to the Contemporary line from Sigmas Global Vision. Make this lens your all-in-one lens to handle any shooting scenario. A 4-stop optical Image Stabilizer – specially designed for the lens’ specific focal length range – works to counteract image blur, which can occur during handheld shooting, or at slow shutter speeds. Tamron 18-200mm f/3.5-6.3 Di II VC Lens for Canon EF AFB018C-700. VC Image Stabilization. With 32GB of storage space,the card allows you to take plenty of photos and video without running out of space. Tested, works great. In very nice condition. Missing front lens cap. .
Tamron 18-200mm f/3.5-6.3 Di II VC Lens for Canon EF AFB018C-700. VC Image Stabilization. Elite Series Digital SLR Auto-Focus Power Zoom Flash with LCD Display, Bounce/Swivel for Canon DSLR (Black). With 32GB of storage space,the card allows you to take plenty of photos and video without running out of space. 【Excellent 】 Sigma 18-200mm f/3.5-6.3 DC OS Lens For Canon W/Hood. ★Sigma 18-200mm f/3.5-6.3 DC OS Lens For Canon W/Hood★. For sale is Used Sigma 18-200mm f/3.5-6.3 DC OS Lens For Canon W/Hood from Japan. Equipped with zoom lock switch that prevents naturally falling when in portable mode advanced zoom lens Nikon DX format with enhanced convenience. 100% Money Back: non-opened (original condition). We do our best for you!! 【MINT in Box】TAMRON AF 18-200mm F3.5-6.3 LD XR Di II Aspherical IF MACRO (Model A14). for Sony A Mount from Japan #129. ■ Appearance. Appearance is beautiful. tiny scuffs from normal use. There is no separation. Asia, Middle East. Even if you think to yourself, "But the item I want is only available in Japan.". TAMRON 18-200mm F / 3.5-6.3 DI ‡U VC new from japan (1129. Our Products are 100% Authentic. ). Function:(Lens, finder, mirror, focusing screen, Accessories Ex filter, etc. ). Optical system:(Lens, finder, mirror, focusing screen, Accessories Ex filter, etc. ). I will look it for you. It is not my responsibility that the item is kept at the custom for a while. Tamron AF 18-200 mm Di II VC 18 f < span class = notranslate ' > 3.5 < span class = notranslate ' >-5 years Warranty BO18N CANON Polyphoto 6.3. Italian Official Warranty 5 Years Polyphoto. Even if you think to yourself, "But the item I want is only available in Japan.". We will look for and suggest the best products on your behalf. No retunes on products that show any evidences of use. Exclusive Nikon Super NIC multi layer compensation reduces flare and aperture reflections to a minimum. Internal focusing (IF) for a faster focusing and better lens balance.Specifications Round aperture with seven blades. AF-S Nikkor 18-200mm VR II Lens. Auto and manual focus work well. Zoom and focus rings move smoothly. SWM and both VR modes work properly. - Lens Hood. It shows signs of use. AF-S Nikkor 18-200mm VR II Lens. Auto and manual focus work well. Zoom and focus rings move smoothly. SWM and both VR modes work properly. The lens is in mint condition. - Lens Hood. The AF-S DX NIKKOR 18-200mm f/3.5-5.6G ED VR II Lens from Nikon is a one-lens solution for DX-format DSLRs. NIkon's Super Integrated Lens Coating enhances light transmission through the lens and reduces flare and ghosting. Size: 18-200 mm f/3.5-5.6G ED VR II. Lens mount: Nikon F. Lens type: zoom lens. Lens construction: 12 counties 16 (3 aspherical lenses, 2 ED lenses). Zoom (optical): 11.1 x. Motor type: ultrasonic motor. Features ?. Remarks: 35mm-format high-magnification zoom lens of translated at 27 to mirror-less "NEX" corresponding to the 300mm. Our Products are 100% Authentic. Nikon Zoom Lens AF-S DX NIKKOR 18-200mm f / 3.5-5.6G ED VR II for Nikon DX new. Most of my products follow the Japanese electrical standard. If a conversion adapter can handle the electric power, all you need to do to use the product in your country is to change the plug to type A.